The word “Muavze”, meaning compensation is a relieving word and it is an irony that everyone is eyeing for ways to distill some form of personal advantage from what is expected to be most bloody communal fighting. Apparently a dead horse is an instigation for entire community to go into riot prep mode. While no one thinks of ways to prevent the riots, everyone is preparing for them from politicians who are keeping prepared speeches to be given at the beginning and end of the riot, to speech writers, to police team going on high alert ready to intervene after the riot begins, but not before, to arms and knives sellers hawking their wares to the highest bidders. Even some brave individuals are preparing to sacrifice the men in their families so that the remaining members of the family can benefit from the compensation that the government has announced, for anyone killed during the riots. It is such an irony that value of life and limb is predetermined and therefore the riot is now looked at by everyone as a mere fact of life to deal with and benefit in ways they can. It is absolute genius of Bhisham Sahni that he has taken most terrifying subject of communal bloodshed and expressed it as a comedy, without losing sight of the intensity and impact of the riots in a community. It is also absolute genius of brilliant director Agastya that he has managed to transform the play into an amusing musical through catchy lyrics and parody music, without losing the seriousness of the subject. 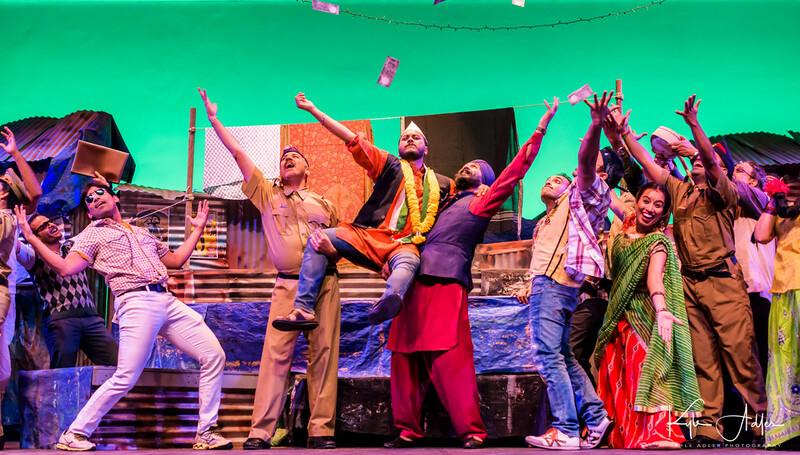 Starting with juxtaposition of opposing words like riots and compensation, the entire play offers a medley of opposing ideas, characters, actions, settings, and phrases. For instance, a contract killer adheres to strict code of ethics and also does not drink alcohol so he can go home, drink milk, and forget about the killings and sleep happily. There is juxtaposition of settings and also of lyrics in songs, for instance, parody of song, “Some of my favorite things” in film Sound of Music has become “Muavza jo de de humko” and song “Vaada tera vaada” of film Dushman has become “Yeh hai mera neta”. 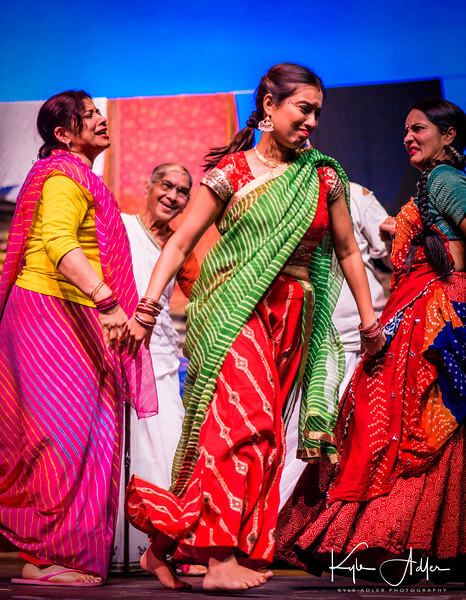 While the play is a window into the world of the communal fighting and the toll it extracts in a community, it also speaks to immense resilience of human beings. When extremely heart-rending situations become a way of life and get ingrained in the system, when human beings are mere cogs in a gigantic wheel, unable to stop or challenge, then their choices are to get crushed by the gigantic wheel or become part of running it and extract personal benefit. The ultimate irony is that when masses pick up the call to propagate the system then the system gets more entrenched and the play ends in a nightmare when contract killer is popularly chosen to become the political leader. Kudos to NAATAK for such a timely play. This is an absolutely brilliant and not-to-miss play of this theater season in the bay area. For tickets, go to www.naatak.com . @NAATAK, Alka Sippy, Anitha Dixit, Bhisham Sahni, Harish Agastya, Indian politics, Kyle Adler, Manish Sabu, Muavze, Rajesesh Tripathi, Ritwik Verma, Saurabh Jain, Srikar Srinath, www.naatak.com .